Is it a Raffle Lucky Lottery? Do you remember when you were a kid your school had a raffle game? The sole purpose was to collect some funds for a charitable cause. The tickets sold out helped the community in many ways. The prize may be big or small, but everybody feels good when they buy a raffle ticket. After all, they get to help out a group they care for, and winning is always a real possibility. The cost of ticket printing and promotion is low in comparison the money made. Raffles thus are a time tested method of fundraising that seems to have always been a part of our culture. Raffles have been around in one form or another since possibly the beginning of human civilization. Even before lotteries had been invented or the first raffle tickets were printed, The Old Testament tells us that Moses used a lottery to award land West of the Jordan to his people. The ancient Babylonians, Egyptians, Greeks and Romans alike loved playing raffle like games of chance, using dice or bones to cast lots and draw winners. Soon, these simple games of chance evolved into endeavors with real fundraising potential. Around 100 BCE, during the Hun Dynasty, the Chinese invented Keno, a form of lottery, which is still popular today. The money from Keno draws was used for defense and civic projects including the construction of the Great Wall of China. Lucky Lotteries are just like Raffle games. 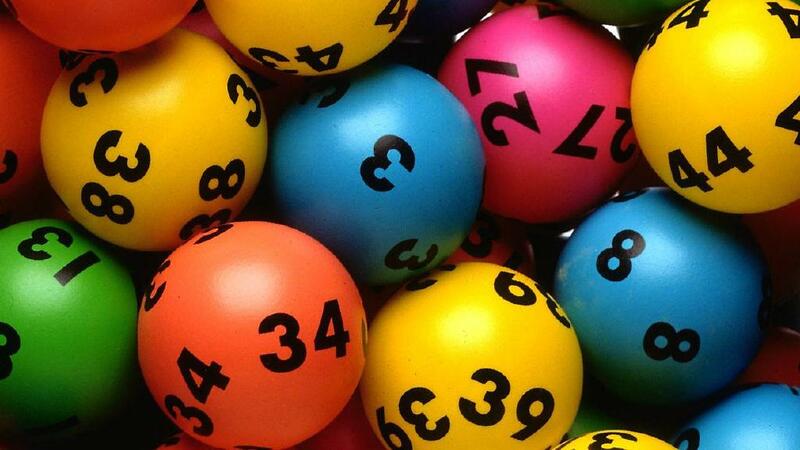 It is the current brand name given to draw lotteries administered by Tattersalls, after originally being administered by New South Wales Lotteries. There are two lotteries that run under this name: the $2 Jackpot Lottery and the $5 Jackpot Lottery. (Both denominations exclude agent’s commission.) Since March 2015, the lotteries have been available in Tattersalls jurisdictions. All tickets are “auto-picked” by the computer and are usually allocated sequentially, but those buying 10 numbers or less can have their numbers selected at random. Tickets can be purchased up to 10 draws in advance for the $2 lottery, and two draws for the $5 lottery. 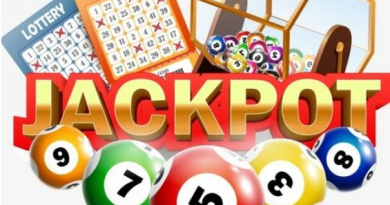 In recent years the $2 Jackpot – which is statistically more difficult to win than the “6-from-45” Tattslotto-style games – has reached more than $10 million more than once through continued jackpotting. The highest jackpot win to date in the $2 Jackpot Lottery is $16,320,000, won on 6 October 2009. The highest jackpot win to date in the $5 Jackpot Lottery is $38.185 million won on 22 November 2011. Draws are conducted soon after all tickets are sold at the NSW Lotteries offices, and prizes can be claimed the day after; summaries are often printed in major newspapers. For the $2 lottery, on average one draw occurs each morning at the NSW Lotteries offices, and sometimes more than one. The lesser demand for the $5 lottery means that a number of weeks often passed between draws. Due to the delay between selling tickets and drawing them (particularly for the $2 lottery), a ticket purchased today may drawn several days from today; by that time, the jackpot amount advertised may have already been won by an earlier draw. NSW Lotteries now adds a disclaimer to this effect when advertising these lotteries. A jackpot ticket number is then drawn, separately from the main draw. A jackpot ticket can only be one of the previous tickets drawn which means you must be drawn twice to actually win a jackpot prize If the ticket number drawn matches a winning number exactly (one-offs do not count), then they win the jackpot; otherwise, that number wins 10 free tickets for an advance draw and the jackpot increments by a certain amount. 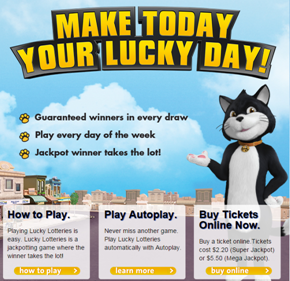 New South Wales Lotteries have also conducted a number of $10 draw lotteries in the past. The most recent $10 lottery conducted was called Lucky 7, which replaced the Million Dollar Lottery (a non-jackpotting draw lottery that was otherwise similar to the $2 and $5 games) in 1996 and continued until 2001. Each $10 ticket was entered for five consecutive weekly draws. Three separate numbers were drawn, named after the number of digits in each winning number: Lucky 7 (with numbers ranging from 1000000-1999999), Lucky 6 (100000-449999) and Lucky 3 (000-999). Prizes were awarded in a similar manner to Super 66, with a $1 million prize offered for matching the Lucky 7 number exactly, while consolation prizes were awarded for matching the last digits of the other numbers – as few as three digits for the Lucky 6, or two digits for the Lucky 3 number. Just like a raffle, each Lucky Lotteries Super Jackpot has a set number of ticket numbers to be sold (270,000). Once all are sold – i.e., the lottery has been fully subscribed – the draw for that particular lottery can take place. You may choose to be allocated either random (to a maximum of 5) or sequential ticket numbers – but you can’t select your own numbers. Each lottery has a jackpot prize, which continues to grow until won. Due to the unpredictable timing of draws, the jackpot amount advertised may already have been won by the time your lottery is drawn, but there is always a guaranteed minimum jackpot of $500,000 in the Lucky Lotteries Super Jackpot. For this reason, it is impossible to guarantee that the draw or jackpot displayed on the front and play page will be the one the ticket will be bought in. 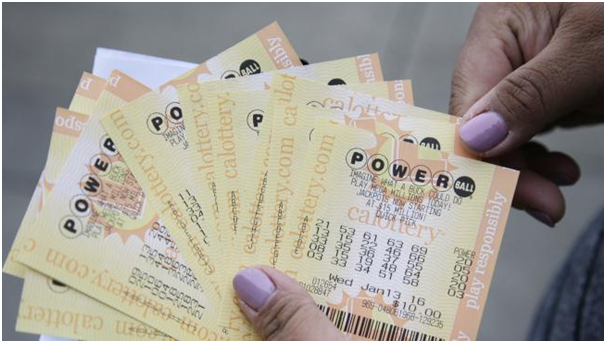 Sales in Jackpot Lottery entries are final and cannot be cancelled. With Lucky Lotteries, if you win you don’t have to share the prize – and that includes the jackpot prize! That’s because individual prizes are won by individual ticket numbers. Whilst a jackpot can be worth millions of dollars, they are never worth less than $500,000 for the Lucky Lotteries Super Jackpot. In each Lucky Lotteries Super Jackpot ticket number is drawn from the full set of ticket numbers in the game. If that ticket number has already won a cash prize in the draw, then it wins the jackpot. If the ticket number hasn’t won a cash prize, then the jackpot increases for the next draw. Each Lucky Lotteries Super Jackpot has a unique, 4 digit sequential number to identify it. Fully subscribed lotteries are drawn in order – ie. The fully subscribed lottery with the lowest number will be drawn first. There are 11 x Lucky Lotteries Super Jackpots on sale at any one time – the current lottery and 10 forward, or future, lotteries. Each Lucky Lotteries Mega Jackpot has a set number of ticket numbers to be sold (200,000). Once all are sold – i.e., the lottery has been fully subscribed – the draw for that particular lottery can take place. You may choose to be allocated either random (to a maximum of 5) or sequential ticket numbers – but you can’t select your own numbers. Due to the unpredictable timing of draws, the jackpot amount advertised may already have been won by the time your lottery is drawn, but there is always a guaranteed minimum jackpot of $1,000,000 in the Lucky Lotteries Mega Jackpot. Whilst a jackpot can be worth millions of dollars, they are never worth less than $1,000,000 for the Lucky Lotteries Mega Jackpot. In each Lucky Lotteries Mega Jackpot ticket number is drawn from the full set of ticket numbers in the ga If that ticket number has already won a cash prize in the draw, then it wins the jackpot. If the ticket number hasn’t won a cash prize, then the jackpot increases for the next draw. Each Lucky Lotteries Mega Jackpot has a unique, 3 digit sequential number to identify it. There are 3 x Lucky Lotteries Mega Jackpots on sale at any one time – the current and 2 forward, or future, lotteries. You can buy lucky lottery ticket online by registering yourself online at nswlotteries.com.au at the same price you’d pay in-store. With fast and easy registration process and you’ll be able to deposit funds, choose the number of tickets and put your entries online. Or you can buy at your local NSW Lotteries Outlet. You have to be 18+ and a resident of New South Wales resident. All members are required to confirm age and identity before being able to withdraw funds from your account. You have 90 days to verify your account which you can do quickly and easily online. Once you’ve registered, you’ll receive a welcome email with your member log-in details, and you can check your full transaction history online through your account. Buy a QuickPick in under 60 seconds if you have funds in your lotto account. Play favourites and you can buy them all from a single page. You can transfer funds by BPay via your bank, or ‘on the go’ with Visa or MasterCard through our secure payment gateway. If you win from an online purchase and you will be automatically informed. Also your money will be deposited directly into your lotto account.